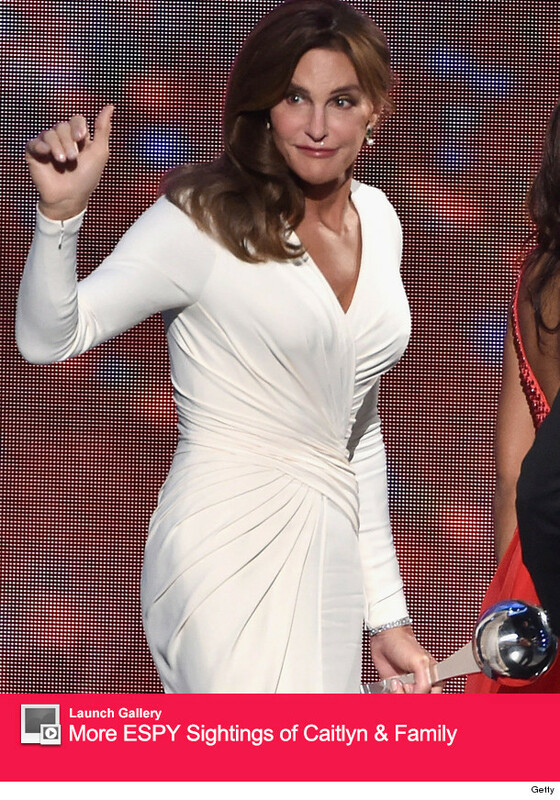 Caitlyn Jenner Honored at the ESPY Awards -- Which Family Members Showed to Support? Caitlyn Jenner just made a big splash at the 2015 ESPY Awards, where she received the Arthur Ashe Courage Award at tonight's ceremony. The "I Am Cait" star looked gorgeous in a white wrap dress at the event in Los Angeles on Wednesday, attending with her family by her side. Children Kendall, Kylie, Brody, Burt, Cassandra and Brandon -- as well as stepdaughters Kim, Kourtney and Khloe Kardashian -- all supported Caitlyn as she made her big award show debut. MIA were ex-wife Kris Jenner and Rob Kardashian, who has stepped away from the public eye for over a year. Brody also posted another photo, showing just the Jenner clan ... and Odell Beckham Jr. The pic has some asking whether this was another Kardashian burn from Brody. Candis Cayne -- who will appear on "I Am Cait" -- and Diane Sawyer -- who interviewed Caitlyn for "20/20" -- also attended to show their support. While Caitlyn skipped the red carpet, Kylie and Kendall stunned -- the youngest Jenner stepping out in a gold, skin-tight sequined gown. Kendall showed off her fit physique as well, sporting a form-fitting black dress with sheer paneling. See both looks in the gallery above! During her acceptance speech, Jenner brought awareness to the plight of the transgender community, telling the audience "Trans people deserve something vital: Your respect." "If you want to call me names … go ahead, I can take it. But for the thousands of kids out there coming to terms with who they are, they shouldn’t have to take it," she continued. "You guys have given so much back to me," she then said to her family. "I am so grateful to have you in my life." Despite receiving some criticism, ESPY producers proudly stood by the decision to honor Caitlyn. "I think Caitlyn's decision to publicly come out as a transgender woman and live as Caitlyn Jenner displayed enormous courage and self-acceptance," producer Maura Mandt told Sports Illustrated this week. "Bruce Jenner could have easily gone off into the sunset as this American hero and never have dealt with this publicly. Doing so took enormous courage." Check out more photos of Caitlyn from the event -- and all the red carpet photos above!